The Unity approach to prayer is affirmative based universal truths. Affirmative prayer is the highest form of creative thought. It includes the release of counterproductive, negative thoughts, as well as holding in mind statements of spiritual truth. Through meditation, we experience the presence of God. Prayer and meditation heighten our awareness and thereby transform our lives. Read more about affirmative prayer. We are blessed to have the constant support of Prayer Chaplains. They are available each Sunday to pray with us one-on-one, and to hold the sacred space as we go through this journey called life. 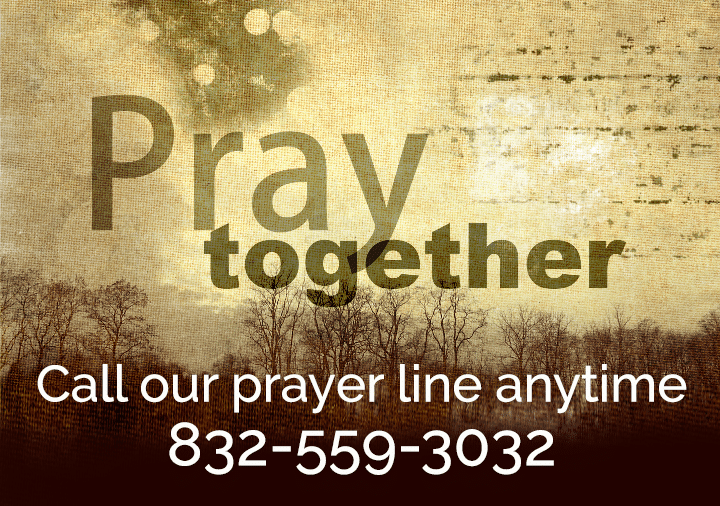 Members of our spiritual community receive a call each month from their Prayer Chaplain to pray with them about challenges, celebrations or whatever they desire. Prayer is a foundational aspect of our faith tradition and was demonstrated by our co-founder Myrtle Fillmore in how she healed her body and spirit. Prayer chaplains serve for 12 months. Information meetings are held each fall. If you would like to request support from a prayer chaplain during the week, please call the church office at 832-653-7980. Prayer Request – What’s on your heart? Prayer is the foundation of our spiritual life and we are here to support you on your spiritual journey. Let us pray with you about the concerns of your life and the lives of your loved ones, as well the celebrations by completing our Prayer Request Form. To further add to the power of prayer, your request will then be sent to Silent Unity, where it will be prayed on for an additional 30 days. As we wish to honor your privacy and confidentiality, we will not contact you unless you request that we do so.